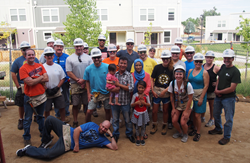 On Tuesday, July 19th, the entire Zunesis team joined with Habitat of Metro Denver to work on the construction of homes for hard-working families in Denver. We believe so strongly in what Habitat does. It's truly our honor to be able to partner with this organization. Zunesis, an IT solution provider headquartered in Lone Tree, CO, has partnered with Habitat for Humanity of Metro Denver since 2008. Habitat for Humanity is a non-profit organization that partners with hard-working families to provide affordable and safe housing. Through this long-term partnership, Zunesis and Habitat have been able to fund and build a total of seven – and counting! – homes in the Denver community. Habitat for Humanity makes an incredible difference in the lives of their partner families. As a non-profit, they rely heavily on the partnership of the surrounding community to provide both the necessary funds and volunteer hours to build their homes. Zunesis is a regular financial sponsor, and even hosts their own annual gala, the Night of Miracles, to raise funds for Habitat. However, the Zunesis team believes strongly in going above and beyond, so they do not stop with a financial donation. Each year, the entire company joins the Habitat construction crews to put in physical labor to help build homes. To add to that, Zunesis CEO Steve Shaffer commented, "This is one of my favorite days of the year. We believe so strongly in what Habitat does that it doesn't even seem like we're the ones donating anything. It's truly our honor to be able to partner with this organization." 2. Making a positive impact on their community. The annual build day with Habitat is a testament to these values, and each year, the company’s commitment to these values grows as the lives of both employees and home recipients are changed through partnership with Habitat for Humanity. Zunesis is a leading IT solution provider with locations in Colorado and Nevada. Our vision centers around an intense focus on serving our customers and bringing value to their business through strategic IT solutions. In 2015, Zunesis was added to the CRN Next-Gen 250 list, recognizing them for their innovation and forward-thinking in the industry. Later, in March 2016, Zunesis was named to the CRN TechElite 250 for the 7th consecutive year as a best-of-breed solution provider with deep technical expertise and premier certifications. For more information, visit http://www.zunesis.com, the Zunesis Blog; or follow us on LinkedIn.